We are a group of friends on a mission to change the world, one paddock at a time. Armed with the slogan “Love Living Life” we aim to raise funds for cancer related charities for the purpose of delivering projects for these charities. If you joined us today, Welcome to the Herd! If not, what are you waiting for? I WANT TO JOIN THE HERD, WHAT DO I DO NEXT? The decision to join the Cows means you’ve overcome the biggest hurdle. Well done! Start training for the race! WHAT KIND OF COWS ARE THERE? 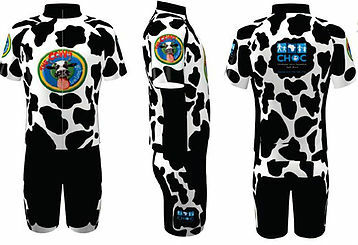 Can I become a Cow if I’m not a cyclist or runner? Sure! Being a Cow is in your heart. We always need volunteers. WHO DO WE RAISE FUNDS FOR? We are raising money for our favourite cancer charity, CHOC. All monies and donations received during any of its campaigns will be used for the sole purpose of the project as stated by the specific campaign. WHEN DO WE NEED THE MONEY TO BE IN? We aim to bring in all the money before the race, although we will allow The Cows an extra week to chase up on pledges, IOUs, promissory notes, donations on serviettes signed in blood, etc. WHAT IS GIVE N GAIN? GivenGain is a secure online fundraising website which has been designed to help people raise funds for the causes they care about through on-line sponsorships. All donations to The Cows are managed through GivenGain. WHEN DO I GET MY OWN GIVEnGAIN ACTIVIST ACCOUNT? Your GivenGain site will be set up automatically and the details will be emailed to you. You can upload a picture of yourself and a short message so that people know what this is all about and what it means to you. HOW DO PEOPLE DONATE THROUGH MY GIVEnGAIN? You will be able to send an email link with your GivenGain website to all your friends. They can click on the “Donate Now” button and fill in payments details. Payment by Credit Card is preferred but we also do EFTs. IS THERE ANY OTHER WAY CORPORATES CAN HELP? There are so many ways in which we need support from logistics to drinks, food, kit etc. Any support you are able to provide we will happily appreciate. WHAT IF I NEED AN s18 TAX CERTIFICATE? Email daisy@thecows.co.za and she’ll send you a form you can fill in. These take a few weeks depending on numbers so please be patient and request your form early. What if I think I’ll fall short of my target? There is no such thing as failure!! As one of The Cows, you are destined for great things and being a cow of your word is the start. If you think you may struggle to reach your target or are concerned that you may overshoot your target (and will need extra wheelbarrows to bring in the money), email us and we’ll see how we can help. WHERE DO I ENTER THE RACES? WHAT’S WITH THE CRAZY COW LOGO? We’ve TM’d that badboy and made it our own. His name is “Chemo” and he’s one of the herd. Don’t use it unless we say it’s ok in writing. Otherwise we’ll brand your rear. HOW DOES IT WORK WITH THE CYCLING KIT? Do we order and pay for it or do you have to raise the money first before you can get it? The deal with the kit is that we provide it to you a week or so before the race with the idea being that by this point you have reached your fundraising target. We understand that if you have not yet reached your target by that point that you will get there shortly. So no, you don’t buy your kit in the traditional sense but rather raise funds which as a result enable you the privilege of riding as a part of the herd.